No big surprises here — this is fairly standard stuff. We’re using the HTML5 doctype, adding head and title elements, specifying the utf-8 (Unicode) character set, adding a page title, and creating the basic form. The form itself consists of an h1 heading, and 3 fieldset elements for the 3 sections of the form. Each fieldset has a legend, and an empty ul (unordered list) element. We’ll place our fields inside these lists. The form ends with a submit button so that the user can send the form. The first field we’ll add to the form is the “Email address” field. This goes inside the unordered list in the “License details” fieldset. You’ll no doubt be familiar with the label and input elements, as well as attributes such as for, type, name, id and maxlength. However, the emailAddress input field has some new, exciting HTML5 attributes and values! 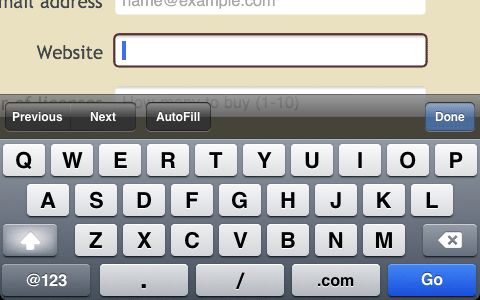 Mobile Safari gives users a custom keyboard when entering data into a type="email" input field. Most modern browsers including Firefox (shown) display the placeholder value as grey text within the field. Once again, we’ve used a new HTML5 input type: "url". As you’d imagine, this tells the browser to expect a URL to be entered, and it will stop the user submitting the form if it’s not a valid URL. 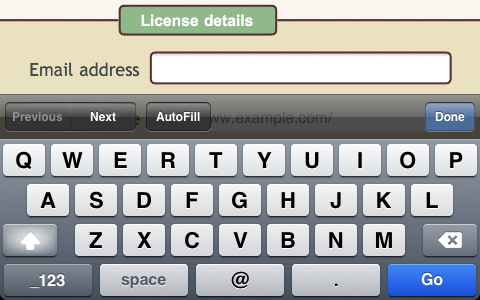 Mobile Safari’s custom keyboard for type="url" fields. This uses yet another new HTML5 input type: number. This tells the browser to expect a numeric value to be entered. If the user tries to enter anything else, such as letters, then the browser prevents the user submitting the form. In addition, we’ve used 2 more new attributes: min and max. These let us specify a range of allowable values for the number — in this case, between 1 and 10 inclusive. Visually, many browsers display number fields with a little spinner to make it easy for users to enter numbers using the mouse. And once again, Mobile Safari brings up a special keyboard. Here’s Safari showing a little spinner control next to the type="number" field. Handy for entering numbers using the mouse. With a type="number" field, Mobile Safari presents its numeric keyboard by default to make data entry that little bit easier. 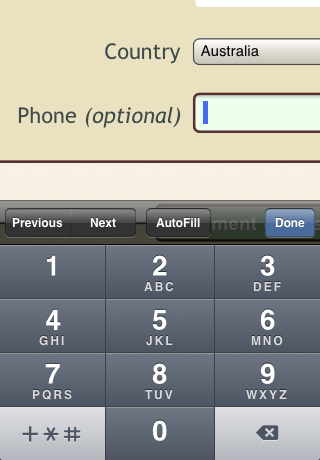 Mobile Safari presents a phone keypad when using type="tel" fields. Lovely! You might have noticed that this field is the only one with a green background when the form loads. 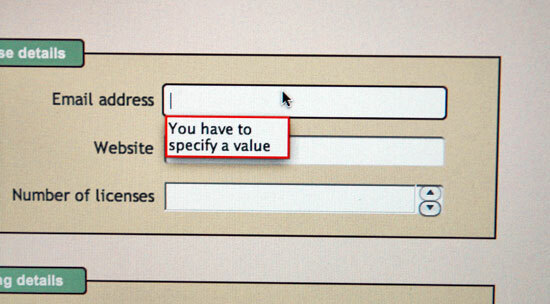 That’s because we’ve made it optional, by omitting the required="required" attribute. An empty optional field is, of course, valid, and we style valid fields with a green background (as you’ll see later). It’s tempting to make this a type="number" field; however, that would prevent the user from entering the spaces between blocks of digits in their card number (and I hate it when websites do that!). Instead, I’ve made it a regular text input field, and added another new HTML5 attribute: pattern. This lets us specify a regular expression pattern to compare the user-entered value with. If the value matches the pattern, the field validates; otherwise, the browser rejects the value. Again, I’ve used a pattern attribute to constrain the input to exactly 3 digits. If the user enters the data in any other format then the browser will reject it. This code introduces another new HTML5 field type: "month". This field type allows the user to enter a specific year and month in the format YYYY-MM — perfect for credit card expiry dates! At a basic level, this field type allows the browser to check that the user has entered a valid year and month in YYYY-MM format (and reject the input if they haven’t). On top of this, browsers can display various widgets such as spinners and calendars to let the user easily select a month and year. More on this later! There are other useful date field types too, including type="date" (for full dates), type="time" (for times), and so on. Here’s a full list. Our unstyled form. We still have work to do! I won’t go into too much detail with the CSS, since that’s not the point of this tutorial. The gist of the above code is to specify dimensions for the form (such as width, margin and padding), colours, and backgrounds. I’ve added a subtle top-to-bottom gradient for Firefox, Safari and Chrome, with a plain colour fallback for other browsers. I’ve also added some other CSS3 niceties, including curved corners and a drop shadow around the form. These won’t work in IE7/8 sadly, although they should work in IE9 (I don’t have it to test). The overflow: auto rule ensures that the floated elements within the form — i.e. the field labels — are cleared, pushing the form downwards to enclose them. This is fairly standard stuff. We give the fieldsets and legends their own distinctive colours and rounded borders, and we also specify various text properties for the legends. We’ve floated the labels left so that each label appears to the left of its corresponding field, and made the labels 40% of the width of the fieldset to allow room for the fields themselves. Set up some common properties across all fields. We use display: block so that we can control padding and margins, and we make them 50% of the width of the fieldset. Set common properties for input and textarea fields. For inputs and textareas, we add a coloured, curved border to each field, and we also add a nice inner shadow using the box-shadow property. The value inset ensures that the shadow is inside the field, rather than being a drop shadow. We also add these properties to the .date class. This ensures that our jQuery Tools date field — which we’ll add later — is styled the same way as the other fields. input fields get a font size of .9em to make sure the text in the field is the same size as the rest of the text in the page. select fields are given some extra bottom margin to create space between them and any fields below. I also used position: relative and top: .7em to push the select field downwards, relative to the field label. textarea fields need to have their font family specified explicitly, otherwise they default to Courier font. We also give them a consistent font size and height. When a field is focused by clicking it (or using the Tab key), we give it a solid brown border to match the rest of the form style. We also specify outline: none to remove the blue outline that Safari adds to focused fields, to avoid it clashing with the brown border. Finally, since the brown border combined with the inner shadow is a bit overpowering, we remove the inner shadow on focused fields. Here’s another great thing about HTML5 forms! We’re given a new selector, :valid, that can select all fields that are correctly filled in. We’ll give them a light green background. This gives the user instant visual feedback that they’ve filled in a field correctly, even before they submit the form. Nice! This is quite a lot of CSS for just one button. But then it is quite a fancy button! The first selector, input[type="submit"], is applied to all input fields that have a type attribute with a value of "submit" — in this case, our “Place Your Order” button. We give the button plenty of margin to add space around it, and some padding to add space between the button text and the border. We also add a solid curved border, as well as a drop shadow, and specify the button’s colour, background, and font. The -webkit-appearance: none; property prevents Mobile Safari from using its own button style. This ensures that our button looks the same on the iPhone as it does on desktop browsers. The next rule makes the mouse cursor change to a pointing hand when it’s over the button, and also inverts the button’s colours. We also apply these styles to the :active button state. The :active state occurs when the user actually clicks the button. For this state, we make the button background slightly darker and change the shadow from a drop shadow to an inner shadow, giving the impression that the button is being pushed down. The first rule deals with the fact that IE doesn’t clip a fieldset’s background colour to the fieldset’s border. Instead, it leaks outside the border, which looks rubbish. I solve this by simply removing the background colour from the fieldset. There’s actually a workaround that fixes the bleed while keeping the background colour, but it involves using relative positioning on the fieldset, which breaks the calendar of the jQuery Tools dateinput widget that we’re going to add later. So I’ve avoided it in this case. The next couple of rules are for IE7 only. They adjust the margin and padding of the field list elements and labels so that the labels align properly with the fields. All done — but does it work? Our basic HTML5 form is done! Open it up in a modern browser and you’ll see some of these HTML5 fields and features in action. Firefox 4.0 Beta 3 doesn’t do any validation at all. Opera, Safari and Chrome do validate, but in different ways. Safari and Chrome simply refocus to the first invalid field, while Opera actually provides a helpful error message next to the field. Firefox, Safari and Chrome support placeholders. Opera doesn’t. Opera generally has the most comprehensive support for HTML5 forms. Here’s a useful table showing current support for HTML5 forms across the different rendering engines. jQuery Tools is a collection of handy UI components, including tabs and overlays. Amongst the tools are Dateinput, for providing a pop-up calendar for date fields; Rangeinput, which adds support for input type="range" (yet another HTML5 field type that we haven’t explored here); and Validator, for providing nice form validation with error tooltips when the form is submitted. 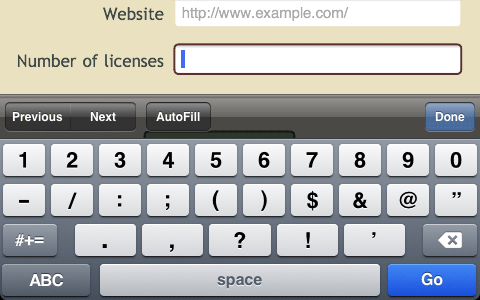 webforms2 provides validation for HTML5 forms, again with error tooltips. However it doesn’t provide any widgets, and has a few compatibility issues with IE8, making it unusable for some forms. That said, it sounds like a complete rewrite is on the cards, which should bring more features and better compatibility. A useful companion library is html5Widgets, which adds support for the various widgets used in HTML5 forms such as range sliders and calendar popups. 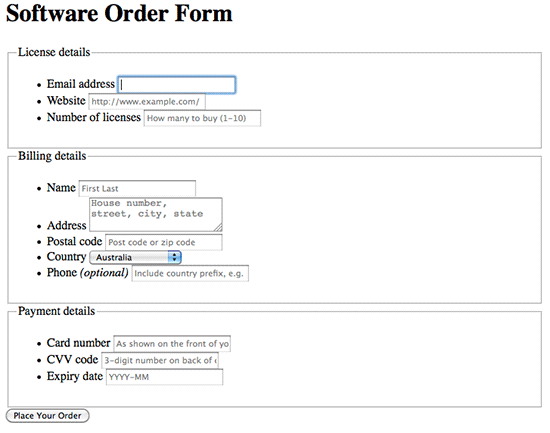 html5form is a jQuery plugin that provides form validation, but no widgets. nmcFormHelper is another jQuery plugin with support for validation and placeholders (although the placeholders don’t work too well in Opera). After playing with the above options, I’d say that jQuery Tools is the best all-round option right now. The validation works well and looks great, as do the slider and calendar widgets. I found a couple of minor issues with IE and Opera — and a bigger issue with Mobile Safari — but overall it looks solid. First we load the jQuery Tools library. There are many ways to do this: you can load just the parts you need, or you can load the whole lot, including jQuery itself, as a single .js file. You can also download the file(s), or simply link to the files(s) on jQuery Tools’ CDN (content delivery network). In this example I’ve opted to load the whole kit and caboodle from their CDN, for simplicity. To activate the tools, we simply call the methods dateinput() on our type="month" date field (passing in the format that we’d like the widget to use), and validator() on our form. You’ll notice that I’ve used some yucky browser sniffing to stop the tools running on Mobile Safari. This is because the date input field becomes inoperable on this browser, and the validation tooltips don’t appear, which is confusing for the user. It’s a shame, but hopefully these bugs will be fixed soon! Finally, the code styles the date input field and calendar popup. To do this I’ve simply linked to the demo skin CSS on the jQuery Tools site. In a real-world site you’d probably want to customize the CSS and host it on your server. It even works on IE7 and IE8, with the tooltips and the calendar in full effect. With Opera 10, both the Opera and jQuery Tools calendars pop up when you click the date input field (not sure why). The validation error next to the date input field doesn’t disappear when you correct the field. Again, no idea why. A Form of Madness: This is the chapter on forms in Mark Pilgrim’s excellent “Dive Into HTML5” book. Improve your forms using HTML5! : Nice article from Opera about using HTML5 in your forms. Rethinking Forms in HTML5: Walks through the various currently-proposed HTML5 form elements and attributes. This has got to be one of the best CSS form design guides I have ever come across. I’ve been wanting to know how to round the borders for ages … but now I want to totally update all my forms. It is a bit scary knowing many people might not have up-to-date browers though. I love this forum. Thank you. @Asa: You’re welcome – thanks for joining! I am going to add into my blog. . . Thanks!